I should start by saying that I read Christian Fiction with a different eye than I do other forms of fiction. Whether this be right or wrong, I feel that Christian Fiction has a different aim and, because of that, I need to look at it with that aim in mind. Because of this, I can overlook some things that would really, really bug my in other genres. Still, the fact that this is Christian Fiction does not give it a free pass. The idea of re-telling the story of Esther and setting it during the Holocaust is intriguing and problematic. The setting definitely works--both the Biblical account and the Holocaust center around the persecution of the Jewish people. Breslin does a very good job of pacing this book along with the Biblical account so that they line up. I found that the general arc of her story was fascinating and it kept me interested in the book. Breslin also had a very good grasp of the main character of Hadassah/Stella. She had a lot going on--she was rescued from one concentration camp and then put into the employ of the kommandant of another. She had to hold up the facade of being a gentile while watching her fellow Jews, including her Uncle, suffer. Breslin was able to effectively communicate all the inner struggles of this woman in a believable way. All this being said, I found two rather big problems with this book. One has to do with the fact that it is Christian Fiction and Breslin had to struggle with how to make it "Christian" while dealing with non-Christian characters. On this count, I don't feel that she completely succeeded. I believe that she tried to remain respectful to the Jewish faith--but having a main character in kind of a limbo land between Judaism and Christianity just didn't work. I think she still could have told this story in a "Christian" tone by focusing on Aric's faith instead of Hadassah's. The second issue was far more troublesome to me. The relationship between Aric and Stella was just outright uncomfortable to read. The idea was that Aric was in love with Stella (at first sight, of course) and that is what led him to rescue her from a firing squad and that she fell in love with him as she discovered his good heart under his SS uniform. Unfortunately, that is not how the relationship came off. Instead, it came across more like a frightening case of sexual harassment couple with Stockholm Syndrome. 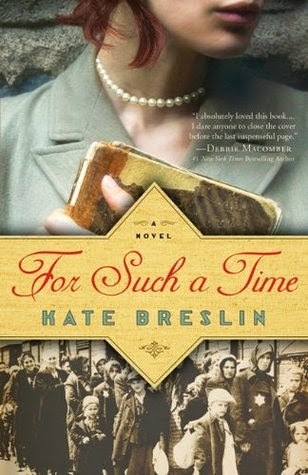 I was incredibly repulsed by the whole situation--and the fact that what I find stomach turning from this book is the love story and not the fact that it was set in a concentration camp should tell you something. Honestly, Breslin could have told this story in a way that conveyed a believable love story and I think that is probably the biggest failing of the book, which is too bad because the overall story is quite good. I might recommend this book to others--but only to those with an interest in Christian fiction and who were willing to overlook a badly written romance in order to see a fascinating re-telling of Esther.